Here we are again on the eve of Halloween/Samhain, possibly my favorite festive interval in the whole turning year. Winter is not far off, and there's a chill in the air that cannot be ignored. Morning arrives later with every passing day, and dusk makes an earlier appearance, village street lamps turning themselves on one by one, hours before they used to. The shorter days and longer nights are all too apparent to a crone's fierce and gimlet eye, at least to this crone's eye. How did we get here so swiftly? The last days of October have a fleeting beauty all their own. In the greater, wider and more rural world, crops and fruit have been gathered in and stored, farm animals tucked into barns, stables and coops for the long white season. Rail fences wear frost crystals, and nearby field grasses crunch pleasingly underfoot. For the most part, foliage has already turned color and fallen, but the great oaks on my favorite hill are reluctant to part with their summer finery and are hanging on to every leaf. A north wind scours the wooded slopes and sweeps fallen fragments into rustling drifts and heaps. Native wild things are frantically topping up their winter larders and preparing warm burrows for winter. The air is spicy and carries the promise of deep cold days to come. This Gaelic festival marks “summer's end', and the beginning of the dark half of the year. According to the old Celtic two-fold division of the year, summer was the interval between Beltane and Samhain, and winter the interval from Samhain to Beltane. For the ancestors, the old year ended at sunset on October 31, and a new year danced into being. Some of us love spooky "stuff", the fey, mysterious and unknown, the old ways. A few of us have Goth aspirations, like Halloween "clobber" and dressing up. Others are fascinated by the myriad ways in which the human species has marked the passage of time over the centuries.The cyclical and festival observances that demarcated ancient notions of time represented pivotal cosmic points, fey intervals when the natural order dissolved back into primordial chaos for a brief unruly fling before regenerating itself, burnished and newly ordered for another journey through the seasons. All the old festivals celebrate the cyclical nature of existence, but Halloween/Samhain does so more than any other. A trio of dearly loved friends and traveling companions passed beyond the fields we know this year. They were some of the wisest and strongest spirits I have ever known, and places are set for them at our table this evening. All three walked through this world loving it fiercely, appreciating its grandeur, grace and reciprocity, cherishing its innate abundance and wildness. Lit from within, they fairly blazed with life and passion wherever they went, and they lighted up every room they entered. Somewhere beyond the here and the now, they are still alight, and I have to remember that. Three cheers for trick-or-treating, tiny guisers and goblins on the threshold. 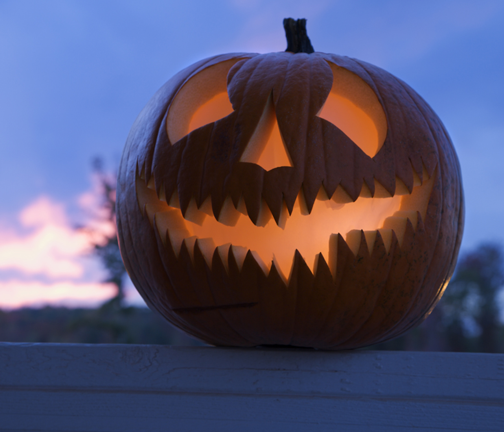 What's not to love about witches, ghosts and goblins, grinning jack-o-lanterns, the colors orange and black? As I dole out treats to wee neighborhood friends tonight, I will be reflecting on the old year and tucking it away under a blanket of fallen maple leaves. I'll be thinking good thoughts about the cycle that is coming into being and trying to remember that endings and beginnings are natural parts of earthly existence and not something to be feared. Happy Samhain, or Halloween, bright blessings to you and your clan. May your jack-o-lanterns glow brightly, and throngs of tiny costumed guests attend your threshold. May your home be a place of warmth and light, your hearth a haven from things that go bump in the night. May there be laughter and merriment at your door, and fellowship in abundance. May all good things come to you. As I posted on another blog, Halloween to me is a brave parade for those of us who are adults. It is a parade pretending we have power over all the bad things that can happen and the denial of mortality. It is a ritual that many have to go through. I do not miss it all that much in my elder years. I do miss the longer days where the sun wakes me and puts me to bed. OK, I must admit, I thought Halloween trick or treating only was a US custom. And not in many neighborhoods any more...like my Senior apartments. But I know there is one urban street here in Black Mountain NC which is closed to traffic so kids can go collect as much candy as they can carry. Happy Samhain also to you! It is indeed a holy day, here very still with heavy cloud. A blessed Samhain to you, as today we remember the ancestors and all loved ones who have gone back to the earth. Enjoyed reading your reflection, Big Sister, and could feel your dear presence in every word which warmed my heart. Blessings on your grieving heart as she remembers the 3 dear souls she lost this year. Sending much love and big hugs your way today... and always. October in my little french village did not have its usual colours....ofcourse much sunnier though. Everything has its beauty is'nt it.